Everyone has the right to expect a positive experience and a good treatment outcome. In the event of concern or complaint, patients have a right to be listened to and to be treated with respect. 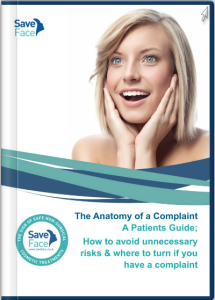 If you have had a non- surgical cosmetic treatment and have been dissatisfied with the level of care you have received, Save face welcomes feedback on your experience. If you have a complaint that has not been resolved or one you feel unable to address to the clinic directly, then please complete the form below to help us assist you. Providing us with as much information as possible will help us provide you with appropriate advice or support in a timely fashion. You can also access more information about making a complaint by clicking the icon to the right to access our patient guide which explains how to avoid unnecessary risks and where to turn when you have a complaint. We also have a useful advice sheet about how to make a complaint which can be accessed here. Click here to read a helpful guide produced by Cosmetic Surgery Solicitors which explains your legal rights if you have had a surgical or non-surgical cosmetic procedure go wrong. If you would like to make a complaint or raise a concern about a Save Face practitioner then please do so by completing the form below. If you are unsure if the practitioner you have been treated by is Save Face registered you can check by using our practitioner checker.